Dunn was a stud in the backfield for the notoriously anemic Buccaneer ground game as outside of a few blips on the radar in the mid-90s from Errict Rhett, the team had failed to field a 1,000 yard rusher or a consistent ground game. At 5-9 there was some concern that Dunn could sustain the number of hits needed for a feature back in the NFL for a 16 game slate. He combined with fullback Mike Alstott to become a potent 1-2 back combo. Starting 10 games in 1997, Warrick finished with 974 yards rushing, 4 touchdowns, and 462 yards receiving and 3 touchdowns. He’d be named to the Pro Bowl and the Offensive Rookie of the Year at the conclusion of the season. While Warrick churned up the yards from scrimmage over the next two years for the Bucs, he wouldn’t be named back to the Pro Bowl until 2000. In that year he had 1,555 yards from scrimmage and 9 total touchdowns. 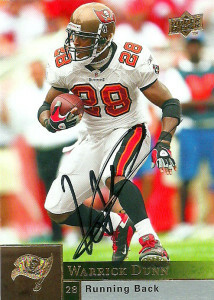 After a down season in 2001, Dunn was viewed as a ‘situational player’ by Bucs brass, and was allowed to sign with the Atlanta Falcons. Opening the 3rd chapter of his football life, Warrick played for the Falcons for 6 seasons. Atlanta promised Dunn at least 20 carries a game, and they delivered on that promise. Warrick ended up starting 83 games, and rushing for 5,981 yards and 30 TDs. In addition he caught 204 targets for 1,635 yards, and set a career marks with a 90 yard TD run, and an 86 yard TD reception. He remained with the franchise through 2008 and was released at his request after the franchise signed free agent Michael Turner. Dunn returned to the Buccaneers that week, and started 6 games that season before calling it a career. Another member of the vaunted 10,000 yard club, his 15,306 yards at the time of his retirement were the most for a player not inducted into the Hall of Fame. Warrick is extremely active in charitable activities. He has been heavily accoladed for his work from the league earning the Walter Peyton Award (2004), the Home Depot Good Neighbor Award (2006), the Whizzer White Award (2007), and the Bart Starr Award (2008). I donated $10.00 to his foundation for his autograph on this card. Warrick was who I thought would be my first success of 2015. Instead he returns to me as the 46th. Not that I am complaining. Such is the nature of the hobby. One of my friends later recalled receiving an autograph from Dunn for free, and lamented that he could’ve at least signed his autograph better on mine. While the check was cashed a clear 2 months before the cards were back in my hands, I nonetheless was happy to get this back.